How do you know when someone is right for the job? Is it their glowing resume or their interesting and witty answers to your interview questions? Maybe they are related to the CFO? If the job is very well defined and easy to observe, like driving a forklift, the best way is probably to ask them to perform some skilled tasks such as stacking pallets. But for management and executive roles, which require a complex mix of cognitive and collaborative capabilities, such simulations are difficult to design and deliver, therefore selecting candidates for these roles is more difficult. Surely, selecting candidates for job roles is such a common occurrence that it can’t possibly be the subject of rigorous scientific study? Well actually, it has been. Industrial and Organizational Psychologists have been comparing different approaches for selecting candidates since the 1950s. The most significant area of development around candidate assessment research has been the use of meta-analytic studies1. These have hugely increased the confidence in the validity of selection methods. Meta-analytic studies use statistical methods to pull together a range of research findings from lots of different studies in order to create a clear, integrated picture of what the overall research presents. These studies remove the impact of sampling errors, range restrictions and measurement unreliability. The results of these assessment and selection meta-studies show that psychometric testing is much more powerful than originally thought. In fact, these studies tell us that psychometrics are the most objective and reliable method of selection for the recruitment of individuals because it is able to predict their performance and the amount of support they may need in their role. Let’s take a look at the results of the largest meta-analysis of selection methods. The predictions are measured on a 0 to 1 scale that describes how well the selection method scores predict future job performance. A zero correlation means that there is no link between the assessment method and the subsequent job performance. Measures that get close to a zero rating such as graphology (handwriting analysis) are no better than randomly selecting people from a crowd and so have no scientific basis. A score of 1 would mean that the method would be correct every time. Unfortunately only hindsight scores a perfect 1. Of the remaining methods, the common unstructured interview scores a 0.4. That is about the level at which we start to believe it is helpful. To give a comparison, 0.4 also happens also to be the approximate correlation between LSAT scores and first year grades in law school. But there are considerably more effective selection methods. Cognitive ability tests, sometimes known as General Mental Ability (GMA) tests, measure people’s intellectual capability. People who get high scores are fast learners who can adapt quickly to new situations and cope well with complex concepts. People with lower scores take longer to acquire new skills and are likely to require things to be more clearly explained to them. Changing jobs is one situation where it helps to have a higher intellectual capability. It is therefore unsurprising that cognitive ability tests correlate well with later job performance, measuring over 0.5. But it is when we combine cognitive ability tests with other methods that we get really impressive results. Scores of 0.6 or higher are regarded as strong predictors. This happens when cognitive ability is combined with a carefully designed structured interview. Structured interviews, also known as standardized interviews, present the same questions in the same order, and candidate’s answers are scored using a predetermined rating scale. This ensures that candidate results can be directly compared to each other. But structured interviews require a lot of work to design effectively and need well trained interviewers. On their own, personality questionnaires get a 0.43 predictive correlation. 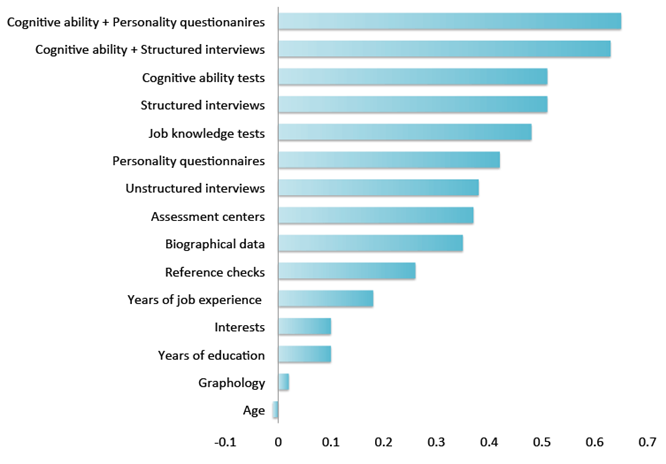 Better than unstructured interviews, but not as good as cognitive ability tests. However, when you combine them you get the most effective method for candidate selection. The two methods compliment each other. For example, a personality questionnaire may identify a candidate as highly confident. This trait suggests someone who is likely to make quick decisions. Is this good or bad? If the candidate scores well on the cognitive ability test as well, then they are likely to make fast accurate decisions. That’s good! However, if they do not score well on the cognitive ability test then they may well be prone to misinterpreting information and so make fast but incorrect or poorly judged decisions. Being highly confident they are then likely to blame others for these mistakes. So understanding and interpreting the results of both methods in combination provides a much richer and more detailed view of the candidate. At hfi we have been providing multi-lingual leadership assessments rooted in psychometrics for world-class organizations for more than 30 years. We always start with a personality questionnaire and a cognitive ability test. We often combine these with further measures including interviews, presentations and job samples. In our own studies over the past thirty years we have seen several cases where the predictive correlation has exceeded 0.8. To achieve these kind of scores requires a strong partnership between our consultants and our clients. This ensures that we fully understand the context and objectives of the assessment before we meet any candidates.  ​If you would like to know more about how carefully selected psychometric leadership assessments can add objective analysis to your candidate selection, don’t hesitate to contact us now!